According to this (final paragraph...) - the license holder is obligated to maintain river levels and have complete control over the operation of the scheme. It would appear that the present license holder at Avoncliff is MIA - and what is known as "hands off flow" is not being maintained by the license holder as obligated under the terms of the license. Is the license holder actually legally obligated to maintain that "hands off flow"? - i.e. keep the weir wet? Looks like the EVIRON mental AGENCY have really cocked this up who dealt with this licence. Sack them??????? 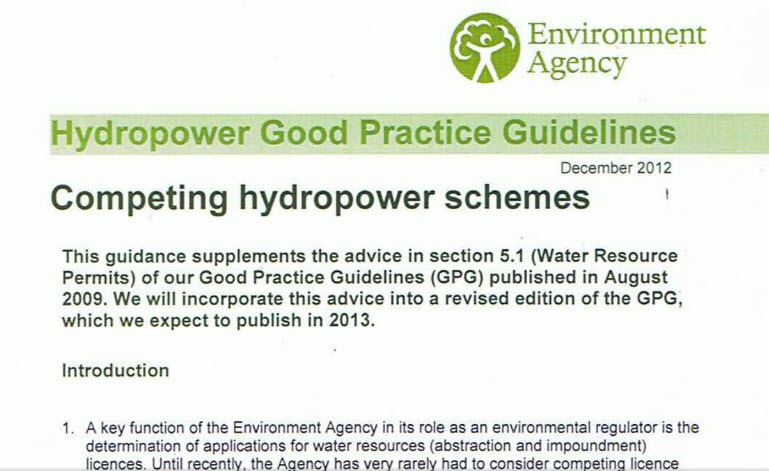 The EA Guidance for run-of-river hydropower development was updated in February 2016. It is no longer available to download on-line. It has to be requested from the EA and is then sent. 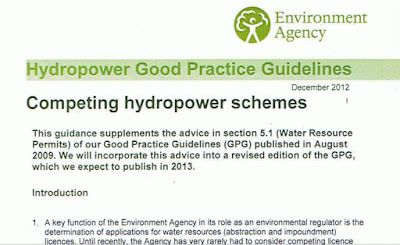 However an interesting extra bit of information is that Competing schemes section on page 7 of 66 is only 2 paragraphs long with a sentence of how to get the Competing hydropower schemes (LIT 7517)advice from the EA enquiries. It is exactly the same as the December 2013 edition (which varies minimally from the 2012 edition). It's quite surprising that the EA is trying to reduce the profile of the, arguably unworkable and corruptly instigated, guidance. Hmmm... they still have the old version up on the web site - which is where I got the image above from ... no obvious mention that the guidance has been modified or even updated. That would be the usual miasma of contradictory, inaccurate and plain wrong "advice" that the EA specialise in? I always wanted to correct people when they referred to the EA as the Environmental Agency until I realised they were right in substance.